Coca-Cola has opened the opportunity for 14 lucky winners to visit Russia for a match of the World Cup by taking part in the Coca-Cola FIFA World Cup Fiesta 2018. 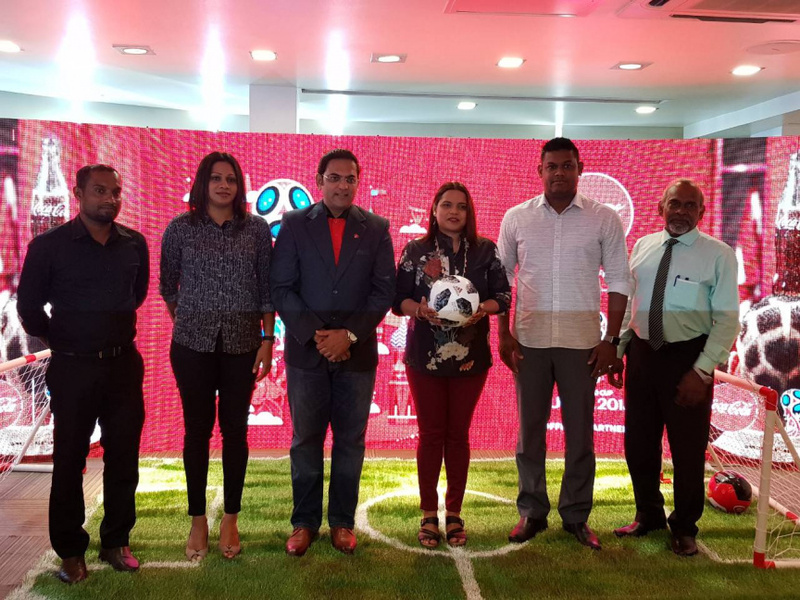 The promotion was officially launched yesterday at Salt Cafe' by the Minister of Youth and Sports, Iruthisham Adam. To take part in the World Cup Fiesta promotion, customers can buy the gold cap Coca-Cola bottle and SMS the code under the cap to 2626. Coca-Cola said that the promotion would go on for 45 days with a daily luckydraw and a weekly grand winner on Saturdays. Daily winners of the draw, held at 7:45 p.m. for the duration of the draw, would receive the original ball of the FIFA World Cup 2018. The winners of the weekly draw would get the opportunity to get the chance to see match no. 56 in the round of 16 in the tournament. While six lucky winners would be selected as grand winners, they would get to a +1 for the visit to Russia according to Coca-Cola. The company would be providing all expenses to both the winner and their +1 on the visit. Aside from the World Cup Fiesta promotion, Coca-Cola said that one lucky winner would be chosen among those who fill a coupon at the MTCC ferry service. Customers can take part in the Coca-Cola FIFA World Cup Fiesta 2018 by buying the 300 ml, 500 ml and 1.25 liter bottles of Coca-Cola.